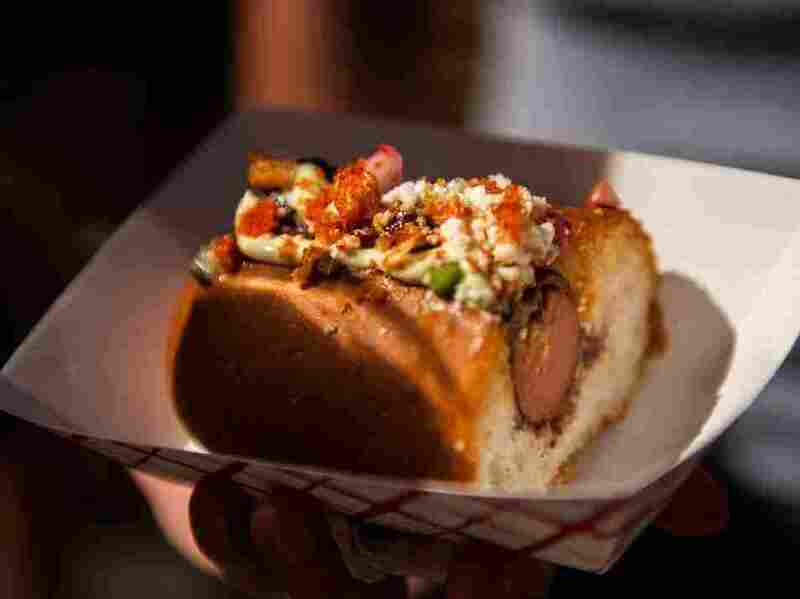 Sandwich Monday: A Hot Dog Cookoff : The Salt For today's Sandwich Monday, we eat our way through a hot dog cookoff, and so far, we have lived to tell about it. The entry from Kuma's. There's a hot dog hiding in there somewhere. There is still debate as to whether the hot dog evolved from lesser sandwich forms or is the work of an intelligent designer, but everyone can agree it's a marvel of simplicity. 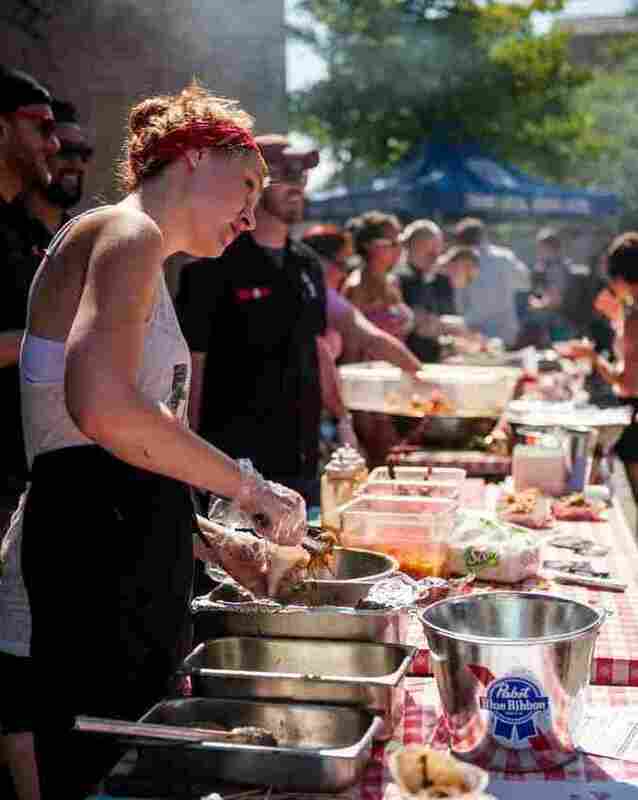 At the Gapers Block Hot Dog Cookoff earlier this summer in Chicago, though, five chefs were challenged to reinterpret the humble tube steak, and we were challenged to eat them all. 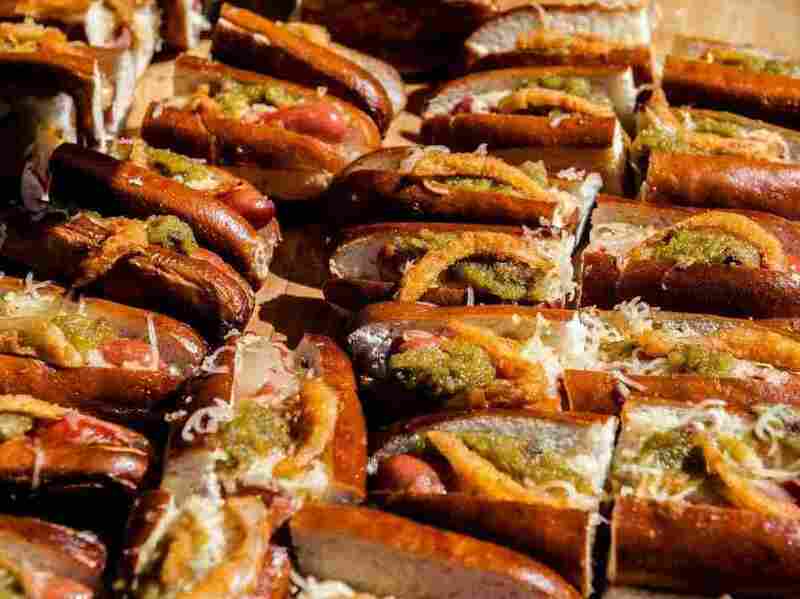 The chefs were told to "start with Vienna Beef hot dogs" and "use them in any way imaginable." Those instructions, when you think about it, are frighteningly open to interpretation. You can't go wrong with overkill. I was hoping that someone might use the wieners to build a meat log cabin in which I could settle down and raise a family, but for the most part, the chefs stuck to the traditional form. The first one I tried was from Kuma's Corner, a beloved Chicago institution known for its burgers, which are named after metal bands (try the "Lair of the Minotaur!"). 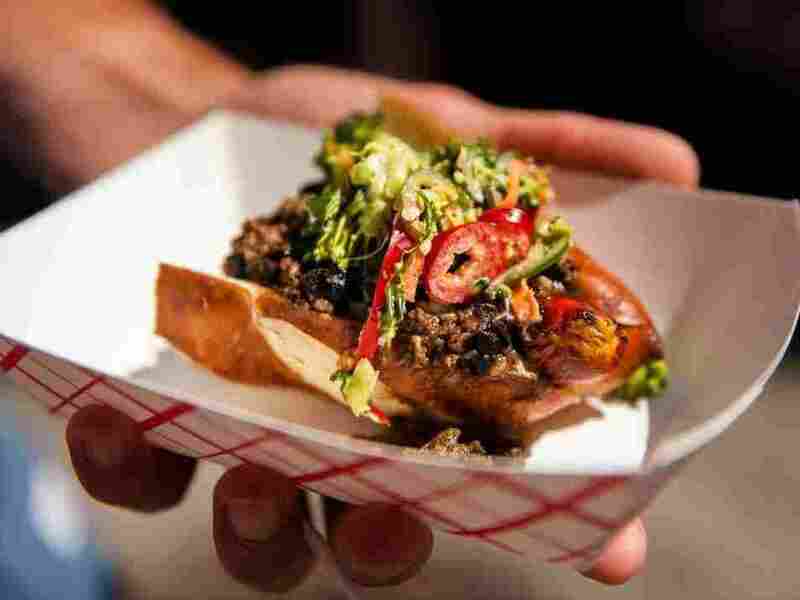 Its dog has a spicy chili, broccoli slaw and an underlying air of menace. 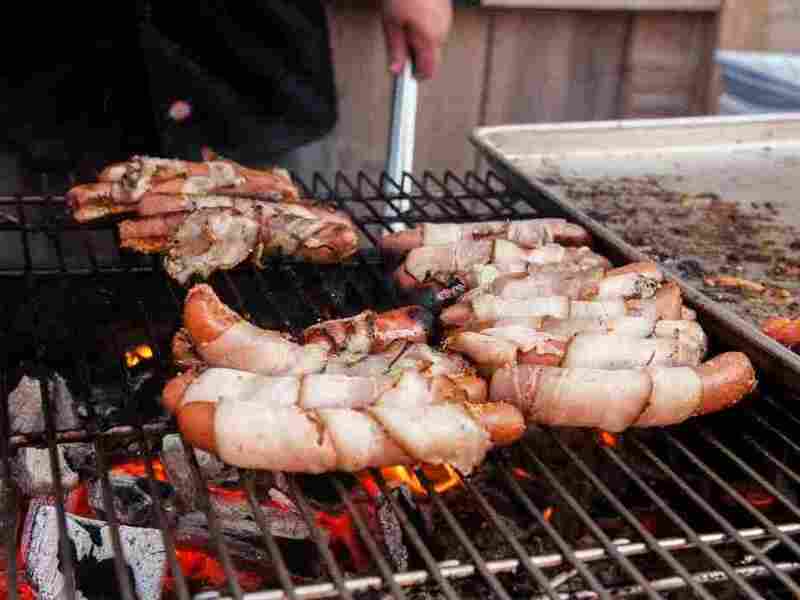 A hot dog, wrapped in another kind of meat, gets wrapped in another kind of meat when you put it in your mouth. Next up was the entry from ManBQue, which is not the name of a cookout cannibals throw on Labor Day but of a "grilling and lifestyle organization" in Chicago. This hot dog is wrapped in Serrano-smoked bacon and topped with chicharrones. "That's a lot of different meats," I said to John, who was manning the grill. "Yeah," John said. "We've got a family reunion in there." 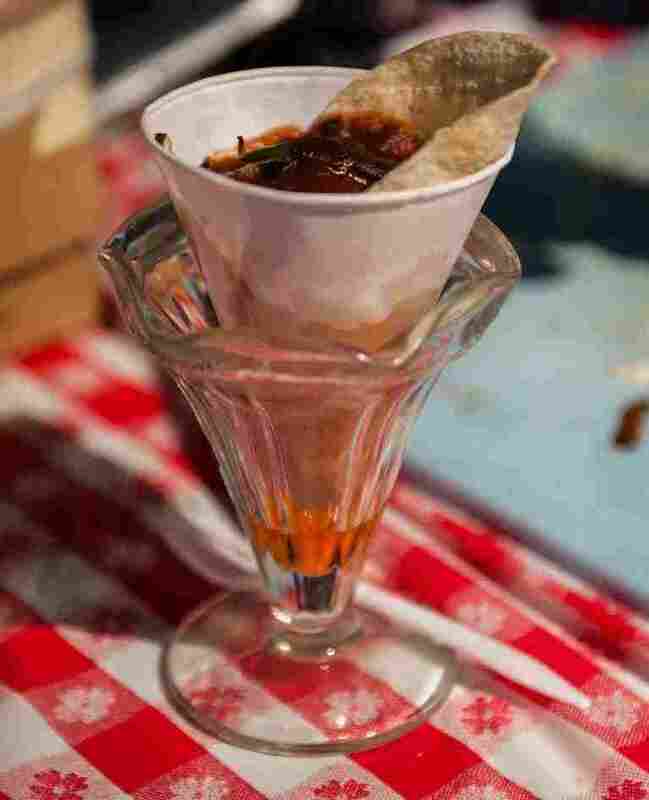 A hot dog sundae! With pulled pork roasted in Dr.Pepper! It is a completely savory taste, in a completely desserty form. Finally, there is balance in a world in which a Choco Taco exists. Note the Flamin'-Hot-Cheeto-Fried Onion, and note what a great pattern this would make for your bedroom wallpaper. As I approached my final dog, I was pretty full, but it's like the last season of Lost: Even though you're tired of it, you stick with it because you've already invested so much and you need to see how it ends, even if it ends badly with [SPOILER] unsatisfying, poorly developed, pseudoscientific religious allegory. Instead, though, my finale was a dog from Harmony Grill, which was topped with a Flamin'-Hot-Cheeto-Fried Onion, so things ended pretty well.